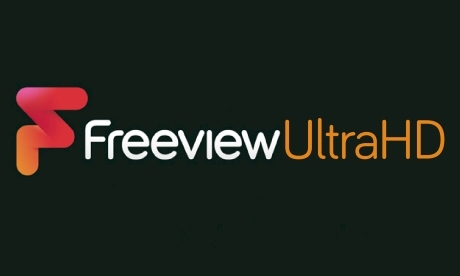 Will we ever have Freeview Ultra HD or Freesat Ultra HD? You can already buy Ultra HD television sets in the high street. If I buy one, how long will I have to wait for Freeview and Freesat to broadcast my favourite shows in the better format? What is Ultra HD all about? By increasing the number of picture cells (pixels) on the television screen, the overall watching experience can be enhanced. The service to have Ultra HD source material. 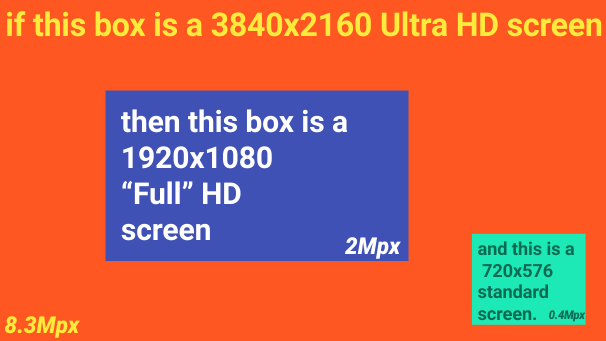 For a television set to count as "Ultra HD" is must be able to display pictures at a resolution of 3840x2160 pixels. As the former number is around four thousands, this is sometimes called "4k TV". This means each image has 8.3 megapixels (million picture cells) which is four times that of a "Full HD" screen and a massive 20 times a standard definition picture (as found on most TVs). The problem with trying to deliver 8 megapixels as moving images is the amount of data created. It is necessary to move on from MPEG4 compression to a new standard called HEVC (High Efficiency Video Coding). This means that existing consumer hardware (set top boxes or in-screen hardware) cannot decode HEVC. Modern computer hardware with an operating system that uses software "codec" may be able to cope, but is processor intensive. This does mean that for broadcast TV this requires a very large amount of bandwidth. Looking at the current demo service on ASTRA 28.2°E (see ) one single channel is taking 24.6Mb/s. This compares to around 3Mb/s for standard TV channels and 5.5Mb/s for normal High Definition. This really leaves two options at the moment, either single satellite channels per transponder (around 44Mb/s) or via a high speed internet connection. Terrestrial transmitters using the DVB-T2 standard provide 40Mb/s. This means that it unlikely that Freeview Ultra HD will be viable soon. If good quality Ultra HD using HEVC can work with 13Mb/s you might be able to provide a three-channel Ultra HD service. In the past a preview service of HD transmissions was first provided from two transmitters (the Guildford mast from July 2008 and Crystal Palace from December 2009) so it is possible that a Ultra HD Freeview preview may happen. It is also possible that one channel may start using using half of the Com8 multiplex as it is mysteriously empty. Given all the above, there is one main issue: who is going to provide the source material? For new content, it is necessary to record at the higher resolutions and have all parts of the production chain using 4k. This is quite straightforward for a single high-value event (such as BT football match), but is harder where existing equipment is in use (in say a news studio). Existing material created for the cinema is already in higher resolutions (film stock or digital cinema), but will require time and effort to make available. It is probably worth noting that popular UK shows have only been made in High Definition since around 2011 (say Doctor Who Season 6), many years after the start of the "preview" HD service. An excellent roundup of how 4K content can (or not) be delivered at the moment. 4K sets have greatly reduced in price over the past two years, and in fact you can get the perfectly decent Samsung 40JU6400 4K set for £549 http://www.johnlewis.com/…7568 - which is pretty much where its full HD equivalent was 18 months ago. The problem is sourcing stuff to watch, and when asked by customers about 4K, I always ask about their current broadband speed, because its that which will deliver 4K in the next year or two. BT, Netflix and Amazon prime all have 4K content, and that will grow, since the market is now there, and of course films are already made in 4K. It will be interesting to see what Sky will do. They have been sniffy about 4K, but BT's bidding for a chunk of the Premier League coverage, and showing it (and the recently the Rugby World Cup) in 4K, means they have to do something - sport is their key weapon, and 4K owners will want to take advantage of 4K content if possible. A 4K box, plus of course streaming, might give them a reply to BT/Amazon/Netflix, and it will also be interesting to see what Virgin does. Their fibre network will be a advantage in any battle for viewers. Should people buy 4K? I was actually taking about this to a couple yesterday. They said they didn't watch that much TV, did not record, yet wanted something reasonably decent and a size that was going to fit a reasonably sized and multi-purpose room. The gentleman liked a Sony 4K (and its was very good on Full HD, which is the true test), and his wife asked whether 4K was needed. I replied that it was up to them, and perhaps the Full HD version was suitable for their needs. However, by the time a deal with a soundbar was added up, the cost of buying the 4K TV and soundbar was exactly the same as buying the Full HD TV, and then buying the soundbar at full price. I suspect that on prgmatic grounds, they will probably go for the 4K. And that makes sense, if only because whilst you can watch HD on a 4K TV, you cannot do the opposite. And if your spending a fair amount of money on something you don't purchase very often, then future-proofing yourself makes sense, as long as the differential in price is not that large. Someone I work with occasionally pointed out some time agao that people bought HD TV's well before HD was available widely - the market for equipment was ahead of content. I suspect the same thing is at work, but that market will drive more content to be available. I agree about the benefits of buying 4K as you outlined, if the total package price is so similar it's worth getting the newer spec equipment. It's worth bearing in mind that a number of programme providers are working with electronics designers and manufacturers to have the necessary studio and broadcast equipment available soon. Some are talking of starting a 4K provision late this year or early next, though much depends on how well the projects achieve the desired solutions. My brother is one such designer and is aware of other project teams at other companies also working on the gear needed. It appears that 4K may be available 'over air' as well as via the internet. For the latter, it will be necessary to have a sufficiently fast service and a large enough cap, if any, so the amount of data does not exceed the limitations imposed. I very much doubt that the acuity of the human eye will allow anyone to detect the difference between HD and 4K (let alone 8K which is already being demonstrated at the trade shows). I'm typing this using a 4K computer monitor, and I've convinced myself it's superior to my old 24" HD one, but (of course) I sit only a couple of feet from the screen. Unless your living room is big enough for a 100" telly (and you then sit almost on top of it) I'm not sure what benefit 4K gives you. Quentin Vole: We use tellies as monitors too. On Windows XP, the displayed lines and text are at the level of single pixels - the dot on the letter 'i' is a single pixel. My 32 inch telly is too small for me to use at 1920x1080 so I use it at 1280x720. Viewed at a distance of about four feet, we find a 42 inch (HD telly) is sufficient for use as a monitor at full HD resolution. For an UHD panel to be equally readable, the pixels need to be the same size as in the 42 inch HD panel. Thus an 84 inch UHD panel would be required. MikeP: I think 'over air' will be a while yet - the amount of data needed is far larger than HD, at present 4 times or more . Now if compression can get it down to a more managable level, great, but the talk is of having relatively few channels in 4k if your using DVB-T2 tuners. Streaming and via dish is more likely at the moment. However, your right about the amount of data required just on ISP networks - its going to be interesting how well it copes. Quentin Vole: A decent 4K TV showing HD will look pretty similar to a Full HD screen, perhaps even slightly better, even though its upscaling. However, just look at a demo of something like House of Cards in 4K (in pretty much ever show room!) - the level of detail is amazingly good. And of course you can sit rather closer (which is why a 4K monitor may be no bad thing!). Was HD better than SD. Clearly yes, despite all the people who reckoned that you only could see HD properly on a really big screen, etc. Is 4K better than HD? Absolutely. At present its difficult to gauge just how much better, simply because we see lots of lovely demos, but largely without the capacity to see what the same thing would be like in SD or HD. However, Hollywood movies are available to stream in 4K ( http://4k.com/movies/), and I suspect watching them side by side, we would very quickly see a difference. Of course we can do that now, just by going to the cinema. Films these days are projected in 4K, whereas they are not projected at 1080p - you could do so, but we'd probably want our money back if they were. As for 8k, you've got the problem of even larger data transfer, plus the cynical amoungst us are wondering if there will be a Sharp corporation even around by the time the Japanese are ready to put it into production. And of course it has to be commercially viable, so you need the appropriate camera's etc to make it all happen. I'd be very interested to see Crouching Tiger, Hidden Dragon, etc on a screen at home in the sort of resolution I'd seen it at the cinema - that would be wonderful. However, since we've only just changed to a flat screen TV from a CRT, that might be a while! However, if you have a 4K monitor, have a look at some free content that you can compare with HD content and let us know - is there an apparent difference? There are 2 benifits to 4k not mentioned here. Firstly is the increase in frame rates to 50fps progresive which should improve motion. Secondly there is High Dynamic Range (HDR) which increases the range of brightness display. There is also an increase to 10bits per pixel and increased colour resolution. So even small screens will benifit from 4k. The best pictures are produced by OLED televisions which are much more expensive. However LG has recently announced massive price drops for OLED which makes them competative with LCD. We also must remember that all TV cameras including 4k have a low pass to reduce the effects of aliasing and moire patterns. So sampled pictures never reach the 1940 resolution. This is why computer generated graphics look so much sharper than pictures from TV cameras. There is another advantage of 4k and that is for 3D using passive glasses. On HD sets the virtical resolution is halved when viewing in 3D. With a 4K screen the virtical resolution can achieve a 1080 3D picture. 4K blu-rays will be available soon. UHD on Freeview would be an interesting concept but would the existing transmitter and broadcast chain from studio to receiver handle it? and UHD4K Freeview TVs and PVR's on sale to pick up and receive the new broadcasts. Anthony: 4K TV's are everywhere - thats not the problem. Films are all made in 4K these days, as are an increasing number of programmes (once you've bought the cameras, off you go). And streaming is OK as well, depending on the speed of your feed and the amount of demand. Even recording isn't a problem - you'd either stream, or just have a very large hard drive. The problem is getting the bandwidth needed by 4K in terms of terrestial broadcasting. The amount of data needed is about 4 times the amount needed for HD, unless compression gets better. Hi. I enjoyed reading all comments appertaining to 4K Ultra HD, I have recently bought a Sony 4K UltraHD Television, the problem I have, I cannot receive Ultra HD transmission from BT because I do not have Superfast Broadband. I can view Ultra HD on YouTube, and the quality of picture is superb. I wish I could receive & obtain the BT package, but Superfast Wales do not think I will be able to receive it for 12 months approx, very disappointed. Remember superfast fibre optic is required at your home for 4K Ultra HD prior to purchasing a 4K TV.